I've talked a lot about timeless design here at Timepiece Chronicle and how there are just some watches that transcend age to become eternal classics. The Omega Speedmaster, the Jaeger-LeCoultre Reverso, the Heuer Carrera. Despite the decades between each of these watches they are still regarded as icons of effective and beautiful design. There is a big difference however between a design that is timeless and a design from another age completely. Two watches designed by Giorgetto Giugiaro managed to surpass their decade of origin and look perfectly at home aboard the USS Sulaco in 2179 A.D. The year was 1983. Matthew Broderick was playing tic-tac-toe against a military supercomputer in War Games, Return of the Jedi was concluding the first Star Wars trilogy and the Swiss watch industry was seemingly in its death throes. It was trying with all its mechanical might to stay alive whilst quartz movements encompassed every aspect of the watch market. Rolex, Omega, Patek, Jaeger-LeCoultre, Piaget had all bent to the crystal will of quartz in order to stay alive. The analog quartz watch was now over twenty years old but there still was no analog quartz chronographs with only red blinking LED lights showing elapsed time rather than hands. 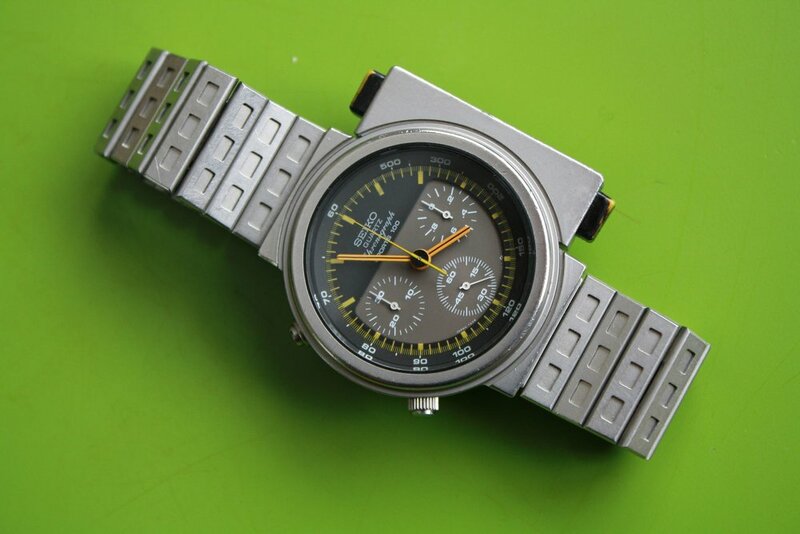 It was the seemingly unlikely candidate of Seiko, the very company that had started the quartz crisis, that was determined to make the first analog quartz chronograph and they were determined to do it right. The 7A28 movement was far better than it had any right to be. It was an all metal, semi-decorated 15 jeweled movement that was at the time one of the most accurate movements around. The dial at 3 o'clock might read in 1/10th intervals it actually measured to 1/20ths of a second accuracy. Each of the chronograph functions were controlled by an individual step motor which allowed for a rudimentary split seconds function. By pushing the 10 o'clock pusher whilst the chronograph is active, the hands would stop, allowing you to record the time but the chronograph movement underneath would keep going. These first analog quartz chronographs are nice but aren't nearly as desirable as those designed by Italian artist Giorgetto giugiaro. Born in a small village in Italy in 1938, Giugiaro moved to Turn at the age of 14 to study design at Golia school. For most of his professional career he would design cars included the BMW M1, Lancia Delta, DeLorean DMC-12 and the VW Golf 1974. He was named car designer of the century in 1999 and was inducted into the Automotive Hall of Fame in 2002. His signature style would become known as "Folded Paper" as his design emphasised flat surfaces and razor thin edges. You either love this style of design or you hate it. Phil Toledano said (when talking to Hodinkee during Talking Watches) that he used to collect beautiful cars but now he collects ugly cars with the Giugiaro BMW M1 sat behind him. Giugiaro designed four watches that all used the new 7A28 movement, two analog and two digital. The two digital watches are not as well remembered as the analog, perhaps by the virtue of how weird they are. Both were intended to be used in professional environments and had fully adjustable straps that could be fitted to a steering wheel or handlebars to allow timing. Before Ayrton Senna was brought into the Heuer fold it was the Seiko Giugiaro Speedmaster that adorned his wrist. In a call back to the tilted pilot's watches of decades before, the dial was angled so it could be read without moving the wrist. The other digital watch actually has a similar case to the Urwerk Geneve EMC Time Hunter, a rectangle so large that would fit better wrapped around a bicep than a wrist. It is the two analog watches that are desirable today. The idealist in me wants to believe that the watch community would have embraced these watches solely on their own merit but the pragmatist knows that part of the appreciation is because of where they can be seen. The Ref. 7A28-7000 was worn by Ellen Ripley and the Ref. 7A28-6000 by Bishop in 1986's Aliens. Whilst not all designed by Giugiaro, most of the main cast are infact wearing Seikos with the iconic Colonial Marines wearing Seiko S234 Pulsemeters and the wonderfully slimy Burke wore a H556-5050. The watches are never referenced by name and there are only a handful of close-ups that betray exactly which watches they are. It's amusing to think that watches that are so of the 1980s could look so perfectly at home in the late 2100's. Ripley's hair, Burke's gilet, the 'futuristic' computers are all of the eighties yet Giugiaro's designs manage to capture the essence of a time that hasn't occurred yet. The Seiko 7a28-6000. Image courtesy of kristian haagen. The matte-black PVD coating makes the watches look quasi-military despite the flashes of red and yellow across the Giugiaro designs. The vertically aligned chronograph pushers on the 7000 look like a piece of artillery strapped to the side of the watch and the indentations on the bracelet conjure up thoughts of tank treads. There is nothing organic about a Giugiaro design, everything has been meticulously placed as opposed to forming naturally. The chronograph pushers on the 7000 are that way so they can be used, the odd offset dial of the 6000 is that way so it can fit on the wrist without being in the way. Giugiaro's Seiko design show watches where function has almost completely enveloped form yet still manage to look damn good at the same time. In the last few years Seiko have issued re-editions of the Giugiaro designs, starting with the "Bishop" SCED003 in 2013 and most recently the SCED037 'Ripley" in 2015. The movement is no longer the over-designed 7A28 but the Giugiaro design is still these. There are five different color options available for these new Ripley pieces and are all priced quite reasonably at 36,000 ¥ or around $340 USD. Vintage Giugiaro's aren't exactly rare but to find on in good condition with a bracelet that hasn't been stretched to hell will cost you around $500 from someone who knows what they are selling. Out of all the thrift shop finds, this is probably the most likely as to anyone not paying attention it just looks like another battery watch from the eighties. But we know it's not. To purchase the re-edition SCED037 from Seiko click here. I'd like to thank Reddit user Seikoholic and r/Japanesewatches for permission to use their photographs. From a bespoke 19th-Century grand sonnerie pocket watch to a modern, serially produced minute repeater, each has a sound and character of its own. Here's to the most musical and magical complication of them all! The Glycine Airman was one of the first pilots watches designed for the jet age. The unique 24 hour display might have turned some people off, but its now regarded as a cult classic. The El Primero movement might not have been the first self-winding chronograph, but it was undoubtedly one of the best.